I get asked this question all the time, so I thought I might as well answer it. Learning the banjo can be as easy as falling off a log or as painful as a good ole root canal. It all depends on how it’s taught. Bluegrass banjo as pioneered by Earl Scruggs sounds like it has a billion notes. It not only sounds complicated, it IS complicated. But friends, it doesn’t have to be that way. Unfortunately, most instruction books and banjo teachers completely miss the boat by starting the total beginner off with complicated rolls and then wonder why their students are so frustrated. The failure of these methods is that you cannot hear the melody. After many years of teaching I have developed a different and much simpler approach that stresses the melody instead of the rolls. I start beginners off by showing them easy melodies that they’re already familiar with, When the student can play just the basic tune of a few well-known songs, I then introduce a very simple roll that I call the “thumb-pinch.” All you do is play an open or unfretted string with your thumb followed by pinching or plucking the 1st and 5th strings together at the same time. Here is an example of a thumb-pinch. Note: the horizontal lines are the five strings of the banjo. The 1st string is at the top and the 5th string is on the bottom. A “O” means you play that string “open” (unfretted). Let me contrast my simple Melody Method with the “normal” way banjo is usually taught. Below you’ll see a rather complicated arrangement of “I’ll Fly Away.” It uses a slide (s) and what’s known as a reverse or a backwards roll. For the beginner, this is pretty hairy stuff. It would scare the pants off of me if I were to attempt to play it as a beginner. The main problem with this complicated arrangement is that you can play it all day long and it’s still not going to sound like the tune of “I’ll Fly Away.” In contrast, my Melody Method is so simple and straightforward you can hear the melody almost immediately. It also lends itself to making the tunes your own by showing you how to plug in different easy rolls that substitute for the thumb-pinch. If you like learning music in the most simple way, I invite you to try my book, Bluegrass Banjo for the Complete Ignoramus. This funny and friendly book has taught tens of thousands of beginners to play. It clearly lays out the simple bare bones melody of 22 popular bluegrass songs that you can play with a thumb-pinch. For each song, it provides additional simple rolls you can go back and substitute for your thumb-pinch. This book makes it so easy, you’ll be kicking yourself for putting off learning to banjo for so long. Bluegrass Banjo for the Complete Ignoramus comes complete with an audio CD so you can hear what each song sounds like. You can also download the audio for free on our website, and for those of you who like everything to be digital, you can purchase the book/MP3 set as a PDF or for Kindle. If you have any trouble learning what’s in the book, give us a call at (800)752-2656 and I’d be glad to help you out myself! Want to learn how to play the banjo. Great! I can teach you with one of my books. I just started taking lessons recently and you are right. As a beginer it’s complicated to master all the rools and you can’t understand the melody at such a slow speed. I know how to play the guitar but I really want to learn how to play the banjo but I’m nervous to purchase it in case it is to hard for me to play! I just thought I would throw this out there as a reply for you. I played the guitar for 17 years, we have bi monthly jams with about a half dozen guitar players. I decided to try and be a bit different and learn to play the banjo. it took me 6 weeks to learn a few rolls and I actually played wagon wheel at a jam. after that weekend I hardly ever pick up the guitar anymore. but enjoy playing both instruments very much. my advice is buy a cheep banjo and hire a teacher as I did to get you started…..you will never regret it. I have never played a guitar or string instrument of any kind however would like to give a chance with a banjo. Hi Colleen. You should definitely try the banjo. It’s easy if it’s taught right. 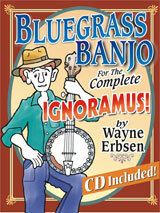 Check out my book Bluegrass Banjo for the Complete Ignoramus! What is the best type on Banjo to start off with? 5 string? or something different.? Thanks a lot. What type of banjo should I buy and how much should I spend, there are so many to chose from its a little confusing. There are two main kinds of banjos to choose from – open back or with a resonator. Open backs are generally used for old-time music, and most bluegrassers use a resonator, although either banjo will work just fine for any style. The resonator mainly makes the banjo look bluegrassy and is heavier and somewhat louder. Even inexpensive banjos sound good, so you don’t have to worry about the sound. Good luck! buy a 5 string. if you buy one about 500 bucks it should be pretty decent, but check at pawn shops, there is always good deals. No need to spend $500 bucks on a starter banjo!!! I bought my decent quality bluegrass banjo, Jameson, on Amazon for about $150, Remo head, real 5th gear peg, decent quality. Best $ ever spent, for me. Also got a Washburn maple openback for $300 there, great banjo. Do you haves book for lefties? I would like to get it for my daughter. I don’t have any books designed specifically for lefties, but I’ll bet many left-handed people have learned from my books. I’m left-handed and I play right handed my instructor said I have more control with my left hand on the fretboard and actually it’s turned out to be a very positive thing who knew !!! I think, if you look at Banjo tab, like you look at a “Screw” with a screwdriver in either hand!, the screw goes in the same way, whichever hand you use!, its as simple as that!, the Banjo tab reads the same, even if you are Lefthanded!, the 1st string is at the bottom & 5th at the top!, Thumb, Index, & Middle, are also the same, just take your time and practice over & over, till you get it right! So I have always wanted to play the banjo and guitar so I got a guitar book and never learned how to play cuz it wasn’t comprehending with me so I was wondering is your book easy to comprehend and learn??? Thanks! My Bluegrass Banjo for the Complete Ignoramus is extremely simple and clear and easy to learn from. I guarantee it will teach you lots about playing the banjo if you give it a try. There is an instructional CD that comes with all of the books, so that you can hear everything played. Otherwise you can check out the ‘video lessons’ section on our website (for free) https://nativeground.com/free-stuff/video-lessons/ . Please get in touch if you have other questions! Glad I came across this. I play piano on probably an intermediate level, but I’ve always wanted to play a hand-held stringed instrument. I love the sound of bluegrass banjo, so banjo it is. I certainly will order one of these books when I find the instrument I want to purchase. Your bluegrass banjo for the complete ignoramus worked for me. Right now I’m working on memorizing the tunes, because I found that I was able to reproduce most tunes once the first measure was given but completely clueless without the kick-start. Anyway, after a few months I bought the guitar edition as well and I wish I had come across your method 3 decades earlier. You mentioned the “dulcimer” and I didn’t even know what that is, living on the other side of the pond but I find a very interesting instrument as well. Since you already recently released the Ukule method, why not follow up with “mountain dulcimer” for the complete ignoramus ? Howdy Banjolero. Thanks for your message. The dulcimer is already very easy, so I don’t feel the need to write a book to make it any easier. I do have a sort of intermediate dulcimer book called Southern Mountain Dulcimer. Best wishes for 2016! Hmmmm… I just play piano. I’ve always wanted to play banjo! Dulcimer runs a close 2nd. I have pain in my hands/arms quite often. Is it hard to push down on the strings? I’m not trying to be a wimp but my health is probably not gonna change any time soon so I’m trying to be realistic. I can’t throw away money now moe than ever! Hi Jesse- You definitely do not need to know how to read music to play the banjo (few banjo players can read music, anyways). My books all have really easy tab, which is far easier than standard sheet music, and I explain how to read it. The books all come with a CD as well, so you can listen to what the song is supposed to sound like. Let us know if you have any other questions! So, I too can not read music. By the way you teach it, are you able to apply that to all songs that are not in your book or on your CD? I tried years ago to play the guitar , gave up just to difficult for me to pick up and I tried 5 or 6 times. I’m looking for something that can me some personal enjoyment and I have always liked the sound of a banjo. Just not sure if I can learn to play it before I give up in frustration. Is there a banjo model that is easier for a beginner to learn on ? Thanks for getting in touch. About any music store can sell you a banjo that’s playable. To me, all banjos sound good, so can’t go far wrong with whatever banjo you purchase. The best source for learning to play the banjo is my “Bluegrass Banjo for the Complete Ignoramus.” It has taught tens of thousands of total beginners to play the banjo, and it can certainly teach you too. Hello, I have wanted to play the banjo for a long time now and am ready to learn. I want to be able to jam out some Mumford and sons and newer banjo music as well as older tunes. Is your book going to teach me in a way that I am able to quickly learn sheet music? I have loved Dolly Parton since she first started… I fell in love with the banjo through her music and many others… HeeHaw was also a favorite and I was amazed at how Roy Clark could play so many instruments!!! I can play a little bit on the guitar as well as the organ and piano… I have longed to be able to play the banjo for most of my life, I am now 55 years young… I do own a nice banjo and want so strongly to be able to play it… I have purchased a couple of lesson books that I found in a book store… They could not be anymore worthless than ice cubes to eskimos!!! Please help I need something easy to learn with!!!! Great to hear from you! I WILL teach you to play the banjo with my book, Bluegrass Banjo for the Complete Ignoramus. I promise it will teach you if you will work with it. If you’re having trouble with the book in any way, please get in touch and I’ll coach you. Thanks! I ordered the book and can’t wait to use it. I have been picking rolls with a few cords for a few months (6). But things are slow and thinking of getting a teacher. At $35 a lesson I hope that might help. One quick question does one have to follow the type of play style of the banjo? I’m an avid ukulele user and started learning the guitar but I’m mostly interested in ukulele and banjo. I really like to play my own way but I don’t want to get criticised for it. I’ve never played any type of instrument before but ive always had an interest in the banjo. Is this book good for people such as myself with no instrumental experience? This book was written for people just like you! It’ll walk you through everything you need to know to start playing, even if you’ve never played an instrument before. I have just purchased a banjo and would really like to learn it. I played the guitar a good few years back but stopped because pressing on the strings was really getting painful to my finger tips. What is different from your book to any other beginner book and why do you think your method’s are better ? Hi Tim. Thanks for your message. Playing the banjo is easier on your fingers than a steel string guitar. My book is different because my simple approach make playing the banjo easier than any other book I have found. Try it for yourself. If I’m not right, I’ll return your money. How’s that? Hello from Down Under Wayne! I’m really keen to learn the banjo and am going shopping for one in the next couple weeks. I have just ordered your book from Booktopia and expect it to arrive within the next few weeks. I’m 33 and have no musical instrument playing experience so I hope it really does help me, and I hope I’m not too old to learn! Will keep you posted on how I go mate. I’m a complete novice. Can’t play any musical instruments at all but somehow own a banjo.. I’ve been looking for a suitable book. I can’t seem to find much availability of yours. Could you please advise the best source to purchase it? Hi, Sam. You can purchase our books online from many websites, including our own: https://nativeground.com/product/bluegrass-banjo-for-the-complete-ignoramus-book-cd-set/ , Amazon: https://www.amazon.com/dp/1883206448/ , and Mel Bay: http://www.melbay.com/Products/NGB104/bluegrass-banjo-for-the-complete-ignoramus.aspx . I’m 46 years old and have never learned a stringed instrument. But I love the banjo. I used to sit and listen to my Great Uncle Bose play for hours. I want to learn to play one very badly. I’m not getting any younger so I’m gonna start looking for one to buy and try to self teach. I’m excited!!! Which is the easiest to play the 4,5 or 6 string banjo? Also what brand would be a good beginner banjo? I don’t want to spend much more than a couple hundred if I turn out to stink at it. Lol. Thanks. 4, 5 and 6 string banjo are used for very different types of music, so it difficult to directly compare, but I’d say that 5 string banjo is the easiest overall. We have two beginner books you should check out for 5 string banjo, depending on whether you are more interested in old-time clawhammer or bluegrass banjo. They are ‘Clawhammer Banjo for the Complete Ignoramus’ and ‘Bluegrass Banjo for the Complete Ignoramus’. I’ve heard that there is a decent Gold Tone open-back banjo being sold on Amazon for under $200- that would be a good place to start. If you want to instead buy a banjo through us, you can write us through our contact page or call 800-752-2656. I don’t play any instruments, at 33years old after a shift in my lifestyle I’ve suddenly got confidence and drive and really want to learn to play bluegrass banjo. I’m looking at buying a 5 string and will no doubt be buying your book as it seems like it will be a major help for me. Do you have any recommendations on a ideal beginner banjo that will sound half decent once I pick up some melodies and rolls? any type of skin I should avoid? Thank you for the instruction, It will help to all, who is new in this field or think it’s hard to learn. Nice work! I have been learning banjo by Ross Nickerson. It is really awesome to learn banjo from basic to advance, step by step! I have never felt, it’s hard after being a student of him. Also, I have been reading various online resources for more details and come to know the myths and faqs of learning banjo. I had been searching for the query HOW HARD IS IT TO PLAY THE BANJO? and get several answers as yours and one mention in the link. Hope it will help others. Deering is the BEST Banjo and IT is AMERICAN MADE!! You can get an awesome instrument from beginner to as much as you wanna spend Blue Grass is a place to start Earl was the Father of Innovation but now days its Fleck and Trishka A good Instrument will make you appreciate what your are working hard to learn! If you are serious about learning Banjo Buy Deering hands down best! It’s a great book for a beginner. I have a banjo picked out that should be a good beginners banjo. A Jamison. Doesn’t cost much,but I’m poor and have to save for it. I do have a Fender acoustic guitar. I know the sound is totally different, but can the guitar be tuned like a banjo? If so, I can use my guitar till I have enough scratch to buy my Jamison. Hello! I have loved banjo music for years, having grown up on the Missouri side of the Ozarks. I have been drawn to play the thang recently. I have a banjo picked out. I have looked at a few beginner banjos, and have settled on a Jameson. Lots of good reviews. I am poor, and will have to save a while for one. I do have a Fender acoustic guitar I have been playing for bout twenty years. Can I tune my guitar like a banjo so I can play till I have enough scratch for my Jameson? I have listened to all kinds of music throughout the years. Nothing comes closer to my heart than bluegrass. Thanks y’all, glad I stumbled in.! Wayne, I just bought a banjo. I have always lived the sound of them. I have no music background, can’t even read sheet music. Will your book show the absolute basics that I can start with? I hear that too many books assume the person can read music or has some music background. Again, I have none. Hi Jeff- YES, our ‘For The Complete Ignoramus’ books for bluegrass and clawhammer banjo explain how to read our easy tab and everything else you need to know. If you have any questions along the way, please call us at 800-752-2656 or email banjo@nativeground.com. Haunt Craigslist and a cheap beginner banjo will turn up eventually. Just bought an Iida with a case for $50. Can’t wait to start shredding on it. Is Clawhammer or Bluegrass easier to learn as a complete beginner?